UK Retailer Marks & Spencer Sees Growing Use of Contactless | NFC Times – Near Field Communication and all contactless technology. Big UK merchant Marks & Spencer said it has completed its rollout of contactless acceptance in 644 stores and is the largest merchant accepting Visa contactless cards in the country. One in seven transactions under £20 (US$30.97) is contactless, said the retailer. The merchant, which sells clothing, food and home products, among other merchandise, said it now is the “leading contactless retailer” in the UK, handling more than 230,000 contactless transactions per week, or nearly 1 million per month, citing transaction data provided by Visa Europe. In a statement, Marks & Spencer’s retail director Sacha Berendji said that contactless increases convenience for consumers, since transactions take less than a second. She indicated in the statement that the merchant also expected customers to adopt mobile payment, which would refer to, or at least include, NFC. Article has about 600 words. 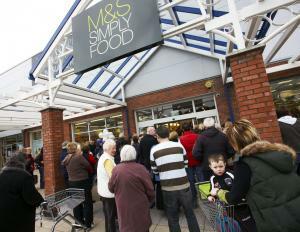 Well done to M&S for driving contactless forward. I am shocked by the naivety of Tesco on their approach to contactless and NFC (by adopting a wait and see approach). Whilst a large proportion of the focus NFC is related to a mobile wallet solution, very little time is being spent on the power of NFC marketing solutions. NFC allows the consumer to actively engage with the brand, giving them a magical experience, and provides real time rich granular data reports on active engagement. When the wallet is finally ready, these marketing campaigns and be linked to payment options giving the consumer a more seamless shopping experience, tap a product for information, like it, share the producton social networks, and purchase it, all at the same time. Are we all waiting to see what Apple are going to do in terms of contactless, whether they adopt NFC or their own technology, when Android currently hold 56.5% of the market as at the 1st quarter of 2013?